Regional climate models reveal how soot-covered snow affects climate and water availability in the western United States. Results: For the first time, a team of scientists from Pacific Northwest National Laboratory has shown how soot deposited on snow affects water availability in the western United States, which gets almost 75 percent of its water reservoirs from mountain snowmelt. The team's work shows soot-covered snow increases the surface air temperature between 0.1 and 1.0°C over the majority of the snow-covered areas in the western United States, causing earlier melt dates. This could mean less snowpack in the summer months, when water is most needed. Scientists have long known that soot from burning fossil fuels and biomass changes the way sunlight reflects off snow. However, little was known about how this process affects the regional climate and hydrological cycle over a specific geographic area such as the western United States, which has complex mountainous terrain near large metropolitan areas. These graphs project the distribution and gradual change in water runoff from February to May in western states. Less snowpack storage is available in late spring when it is needed most. A two-year study that culminated in 2008 answers key questions about how soot deposition affects snowpack, snowmelt, and runoff. The team studied the entire western United States with special focus on the Columbia River Basin, the Sacramento-San Joaquin River Basin, the Central Rockies, and the Sierra Nevada mountains. In the past, global climate models were used for this type of study; but these models were not as effective in representing the diverse terrain and land surface types. In contrast, the PNNL team used a regional climate model to provide the necessary spatial resolution and more accurate and realistic snowpack and stream flow results. The team's simulations show that variation in the soot-snow reflectance significantly changes the regional climate and water availability in the western United States. When snow becomes "dirty" from soot, it absorbs more solar radiation and heats the ground and surrounding air. The snowpack decreases from 2 to 50 mm over the mountains during late winter to early spring. This means less snow accumulation in winter, less snowmelt in spring, and earlier spring melt dates. In short, soot from fossil fuel production is causing earlier melt dates in the western United States, which could affect water availability in warmer months. Why it matters: The impacts of these changes could be profound. In the parched summer months, less water is available for everything from agriculture and hydropower production to sustaining fish habitats. Ultimately, understanding how soot affects snowpack in western states is important for managing water resources effectively. By reducing carbon emissions, a reservoir of snow could be maintained longer into the summer for use as needed. Methods: For their study, the team modified the WRF-Chem computer model to track the deposition budget of soot on snow. WRF-Chem is a chemistry version of the Weather Research and Forecasting model that simulates important climate feedback processes, such as interactions among air pollution or natural trace gases and aerosol particles, water in clouds, and sunlight, simultaneously with changes in meteorology. From 2006 to 2008, the team ran a series of model simulations using the modified WRF-Chem to simulate how much soot deposits on snow each month over the western United States from the Pacific Ocean to the eastern side of the Rockies. They used these results to estimate how much the soot-infused snow reflected solar energy. Next, the team performed three regional climate simulations to simulate the impacts of soot-induced snow reflectance change on the hydrological cycle. What's next: The team will address the impact of other atmospheric particles, such as mineral dust and volcanic ash. Additionally, because the team's simulated soot concentrations were higher than the observed values in the lower atmosphere, further analysis and development are needed to understand and reduce model biases. Research Team: Yun Qian, William I. Gustafson Jr., L. Ruby Leung, and Steven J. Ghan, PNNL. Acknowledgments: PNNL is transforming the Nation's ability to predict climate change and its impacts. This research was supported by PNNL's Laboratory Directed Research and Development funds. Citation: Qian, Y., W. I. Gustafson Jr., L. R. Leung, and S. J. Ghan. 2008. 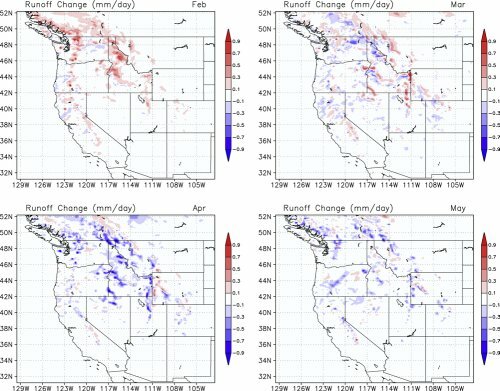 "Effects of soot-induced snow albedo change on snowpack and hydrological cycle in western U.S. based on WRF chemistry and regional climate simulations." J. Geophys. Res., doi:10.1029/2008JD011039, in press.